Is EQ Vital for Change? When an international IT team set out to transform their org, they found change is not just a logical process. Using emotional intelligence mentoring and the Vital Signs climate assessment, they developed a process to make change effective. Here’s how it works. When is the last time you looked forward to change in your workplace? Did it produce anxiety or positive anticipation, or both? Since we face change all the time, why is it still so difficult? A Conversation with EQ Practitioner, Tim Alur on a case of using emotional intelligence to change the reaction to change. Tim Alur lives in Australia. 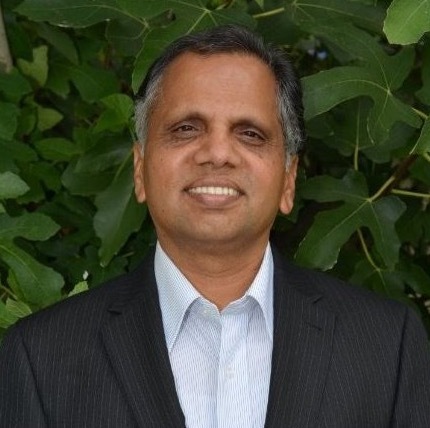 He is a Six Seconds certified EQ Practitioner, a Vital Signs Consultant and SEI EQ Assessor. He works closely with corporate managers and educators in building awareness about Emotional Intelligence and its relevance for daily interactions. So if change can lead to a better outcome in the future, why do so many people resist it? Participants in Tim’s webinar had an array of reasons; from fear, to being out of one’s comfort zone, to the lack of trust that change will lead to something better. Tim gave an example of a time he took part in a transformation project in the IT space spanning several countries. It was a major change allowing people to move from their comfort zone where they were celebrated by their competence for 20 years, to a new setting. In the long run, with EQ mentoring, they were able to make the change gracefully with less anxiety and conflict. C = Conversation within ourselves: “Listen to those conversations. Be aware of feelings and understand the message the feelings convey. Be aware of conversations we have with others during change. Don’t hesitate to reach out to those who have journeyed before us and have managed change effectively. Reaching out to others is not a sign of ignorance but the strength to be vulnerable to discover our capacity to learn and adapt. By doing this we activate the law of interdependence and collaboration. H = Harnessing our experiences and responses, both positive and negative, to change, is very important to adjusting to change. Tim uses a journal to explore these responses. A= Allow others to journey with us. Reach out for help. Be open to others who help you and express how they are experiencing positive change. We can feel supported when we allow others to express their emotions. Being vulnerable is not exposing our weakness, but ceasing from pretense. It is a place of courage and openness and learning. When go through a change, be kind to ourselves by asking for help. N = Navigate: We need to learn to navigate change. “Recently I was talking to a family friend who was changing a career to teaching. I asked how it was going, and whether she ever wanted to go back to her previous work. She said, many times. “We often resort to our comfort zones, but we need to be able to imagine the positive situation that is on the other side of the change to make progress. G = Gaining insight; When we learn to harness our experiences, network and navigate the change, there are amazing insights we experience. Through that we can manage change well. E = Engage: We need to engage change. It is so constant in life, from the moment you are born, it’s natural. Change is a sense of life. So how does this overview relate to working with change in an organization? 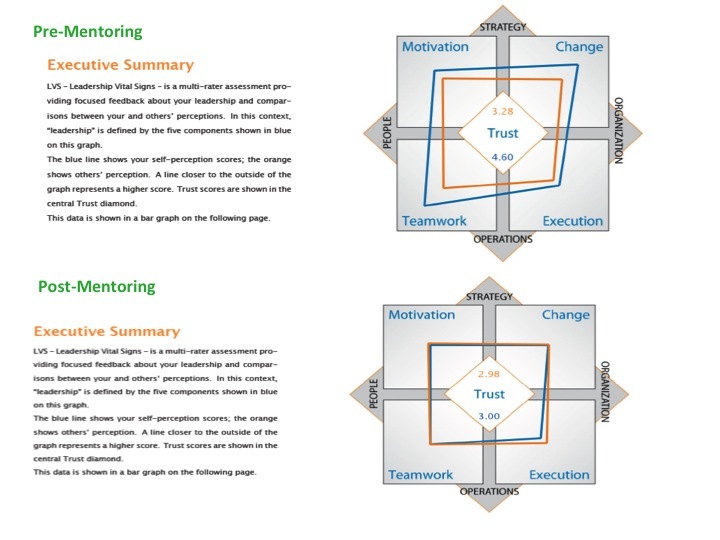 Tim uses Six Seconds’ Organization Vital Signs tools to essentially hold up a mirror to team leaders so they can see any gaps between their own perceptions of how well they are leading, and those of their team members. So how did the leader react when it was revealed that their perception of their own effectiveness differed so much from the way their team saw them? The Vital Signs assessment provided a measure to clarify the need for change and showed leaders how and why to apply emotional intelligence. 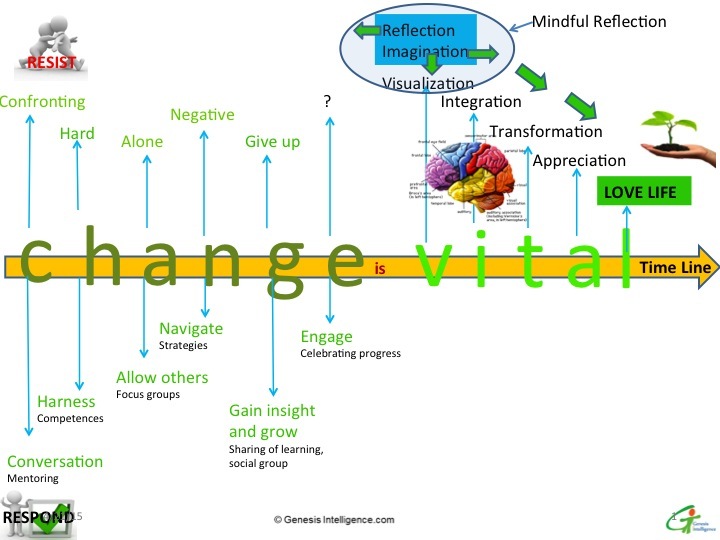 Adding “Vitality” to the change process is about bringing people into a context where they can adapt and thrive. L-Love life and live the change – Express Gratitude. These powerful steps are fueled by emotional intelligence. With added awareness and new tools, we can change the process of change. A well thought out presentation by Tim on how EQ is a vital element in the continuous improvement so necessary in today’s work environment! Jeff, in my corporate experience, there were many meetings that I have attended about targets and milestones and the celebration of reaching the milestones which is the key for progress and productivity. Often times when these milestones are reached some feel burnt out and others celebrate. 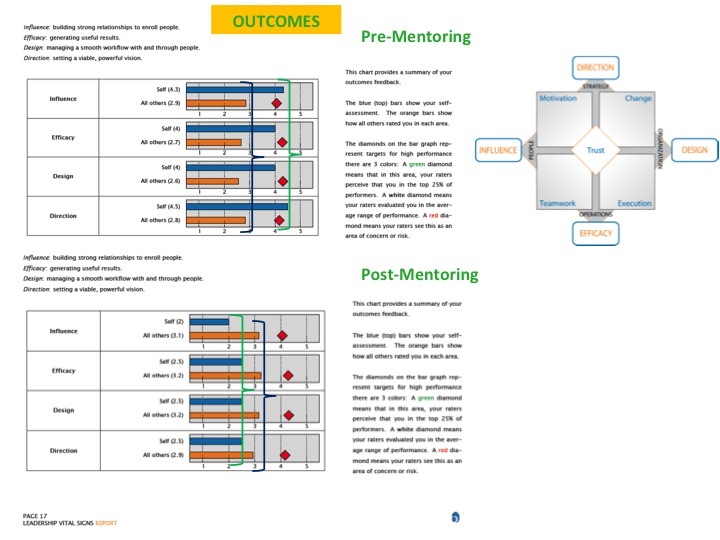 In the culture so focused on KPI’s, if space is allowed in the project plan where individuals/teams are allowed to express their learning experience(emotional and knowledge) in the journey of reaching the milestones, there would be greater engagaemnt and individuals would feel included. I would think that this a an area for “continuos improvement” of social/ emotional operating system. Why lacking in confidence to restudy and change the carrier at the age of 37? How to deal with it? How to built confidence before starting a new venture? 1) Map emotions against a time line prior to thinking of change. 2) Identify the last experience and the emotions related to this experience. 3) Be open to notice if these emotions were positive or negative motivators. 4) Recollect, positive experiences where you felt confident though it could be in a different context. 5) As you remember these positive experiences remember your new task of changing your carrier. This should create a positive climate. Make this as a new memory. 6) Start with celebration of the opportunity to make the change. 7) Visualise the journey of change and engage celebration through the journey. 8) Hope again and again. This article was related to a presentation at the EQ Practitioner course. There was a small segment on how change is related in an organization.